Juanita Lloyd was born on 16 Nov 1918 in Dawn Township, Kent County, Ontario, Canada. Juanita Lloyd was the daughter of Harvey McMaster Lloyd and Nancy Ruby Edna Mae Manery. Her father Harvey McMaster Lloyd died on 15 Dec 1918. 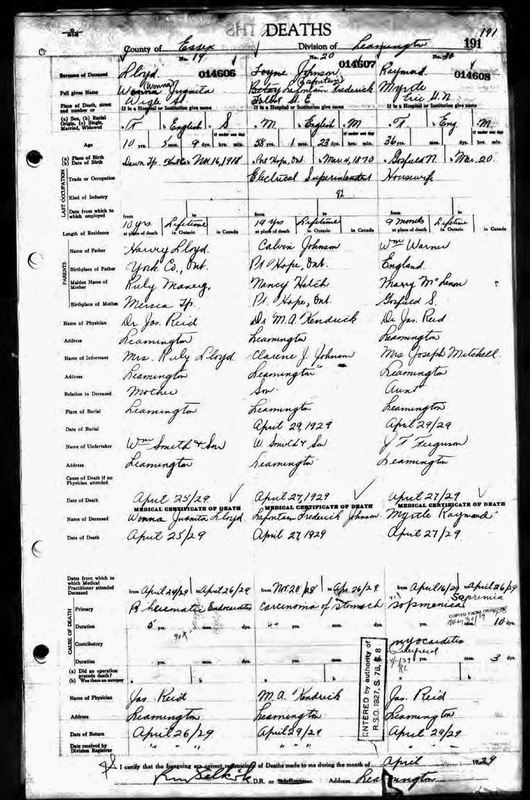 In the 1921 census of Canada she is living with her mother and her brother. Juanita Lloyd died on 25 Apr 1929 in Leamington, Essex County, Ontario, Canada. So sad that she died so young! I am guessing that she never met or even knew of my great grandmother, her half-sister Lillian Townsend.